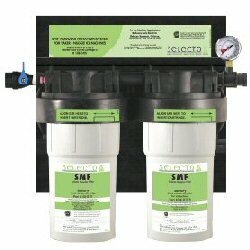 Our SMF Contamin-Eater 710-2 FL Whole House Water Filter media to reduce Fluoride. * For Chloramine, this filter is right for 1 person for a year. Capacity: 15,000 for chloramine. I could write a thousand pages and it still wouldn't be enough to say how thrilled my husband and I are with this water system. We found this system to be effective, easy to install and maintain, and affordable. We finally have peace of mind at every tap - no more stinky, icky tasting water. We are also so thankful for Donna. Her customer service is beyond compare, nothing is ever left undone or to question. She's like dealing with a close friend.